Growing up on a small horse ranch in Western Washington with unsteady income and going through some fiery trials as a child, I have grown to feel the need to help others. Living with a widow with no income as a teen I learned to be so thankful for any little helps from others. Consequently I feel very burdened for people as an adult. In my study of 1 John chapter 3 the past couple weeks I discovered that this chapter is really the essence of a true believers heart. If others cannot see our love for others then are we truly following God? He is all about love and if we are to be like Him then love and compassion should flow from us. In referencing this passage this week in my Bible study I gleaned a few quotes from my MacArther Study Bible. These come from verses 14-24. "Christian love is self sacrificing and giving, Christ giving up His own life for believers epitomized the true nature of Christian love...A practical love that finds motivation in helping others. Where it does not exist, it is questionable that God's love is present...A lifestyle of love in action is demonstrable proof of salvation...Love in action is the true test of a Christian profession...When a Christian recognizes in his life the manifestation of love in deeds and actions, it results in confidence about his relationship with God. Since love is the heart of obedience to the law, its presence shows a life evidence submission to God which He blesses by answered prayer." We sometimes have very good intentions to help those who we know have needs around us but sometimes "life" just gets in the way. Business, downtime, family time and just plain laziness sometimes thwart our best goals. I know that sometimes someone will come to mind and I have a great plan to encourage or help someone but I just forget. But being a person of action demonstrates our true love for others. Being a doer. I need to work on this in my own life. Verses 17-18 say it all, " But whoever has the world's goods and beholds his brother in need and closes his heart against him, how does the love of God abide in him? 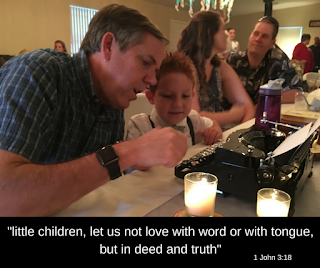 Little children, let us not love with word or with tongue, but in deed and truth."